Mississauga will have a mayoral election as part of its municipal ballot on Oct. 22 when residents will choose a mayor to serve as chief executive of the city for the next four years. The city was incorporated in 1974. Since then, its residents have seen just four mayors. You may not have heard of former mayors Martin Dobkin or Ron Searle, but you’ve definitely heard of Hazel McCallion, the city’s longest-serving mayor at the helm from 1978 to 2014. It was just in the last municipal election — after McCallion retired — that the city elected its current mayor, Bonnie Crombie. Crombie is running for re-election, challenged by seven other candidates — Scott E.W. Chapman, Kevin J. Johnston, Mohsin Khan, Andrew Lee, Yasmin Pouragheli, Syed Qumber Rizvi and Tiger Meng Wu — seeking to lead city council in a post-McCallion era where the city is transforming from cookie-cutter suburbia to an urban, downtown hub. Most of the city’s 721,599 residents drive cars. It has wreaked havoc on major roads during rush hour and sparked an overdue need for public transit options. Crime is also an important issue among residents, with recent data from Peel police showing an increase in violent crimes such as robberies and shootings. Affordability is a critical issue, too. Mississauga has countless homes, but they’re expensive. Recently, the city was ranked alongside Brampton in the top 10 least-affordable housing markets in Ontario. The average home price in Mississauga is $683,819, requiring an annual income of $93,279. Just last month, Mississauga ACORN — a local group representing low- and moderate-income residents — held a rally at the Civic Centre saying the city has a housing crisis, demanding election candidates take action. Creating jobs within the city is also a challenge. Mississauga has an unemployment rate of 8.3 per cent, according to statistics from the Region of Peel. Transit and affordability obstacles persist in the face of several major ongoing condominium projects in the downtown core, including M City, which is expected to give Mississauga its tallest tower. The Hurontario LRT, intended to address transit problems, is expected to be operational by 2022, stretching from Port Credit to Steeles Avenue. Much of the upcoming development in the city has focused around the LRT corridor, attracting housing, businesses and city investment along Hurontario Street. In fact, the last city council pushed for a minimum number of affordable housing units for future developments along the LRT corridor. The Mississauga waterfront is also being developed. Imperial Oil’s former lands of 72 acres in Port Credit are being transformed into a mixed-use community with housing, retail and new waterfront park. Housing in this massive development is expected to include affordable housing units. Future transit plans in the city aim to develop east-west corridors on Dundas Street and Lakeshore Road. Mississauga is expecting $40 billion in new construction investment for the next 15 years. Its AAA credit rating means domestic and foreign businesses continue to consider investing in the city. But as development soars (quite literally), the challenge for Mississauga's mayor is to help transit and affordability catch up. Who’s running for mayor? Scott E.W. 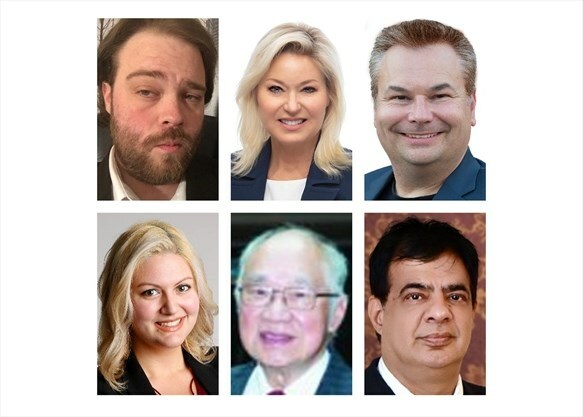 Chapman, Bonnie Crombie, Kevin J. Johnston, Mohsin Khan, Andrew Lee, Yasmin Pouragheli, Syed Qumber Rizvi and Tiger Meng Wu.